Siegfried Mantl received his Ph.D. degree from the University of Innsbruck, Austria in 1976. 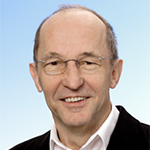 Since 1971 he has been with the Research Center Juelich (Forschungszentrum Juelich), Germany. He is head of the ion beam division of the Peter Gruenberg Institute 9 (PGI-9-IT) and professor of physics at Aachen University of Technology (RWTH Aachen). In 2011 he received an honorary Helmholtz professorship for his pioneering work in the field of strained silicon structures. His interests include the research of nanoelectronic materials and nanodevices, various thin film growth methods and ion beam techniques. Specifically, Si-Ge-Sn heterostructures for novel transistors and optoelectronic applications are under investigation. Particular emphasis is placed on energy efficient devices, such as advanced high mobility MOSFETs with high-k dielectrics and small slope switches, in particular, on Tunnel-MOSFETs and integrated GeSn lasers. He has authored or coauthored more than 340 journal articles, several book chapters and review articles and holds over 20 patents. Reducing the supply voltage, VDD, is the key to lower power dissipation in CMOS electronics. Band to band tunneling transistors (TFETs) have the potential of switching with inverse subthreshold slopes (SS) below 60 mV/dec, unreachable with standard MOSFETs. This allows a reduction of VDD while keeping the off-current low. According to simulations TFETs show superior performance and consume less energy than MOSFETs at VDD < 0.5V. The presentation covers recent achievements on strained Si nanowire and SiGe TFETs with different device geometries. Also the main obstacles limiting the performance as high on currents and steep slopes due to trap assisted tunneling will be discussed. An outlook of the use of the novel semiconductor system Si-Ge-Sn for TFETs will be given. Acknowledgments: This work is partially supported by the EU project E2SWITCH and the BMBF project UltraLowPow.